The smog hovering over many major cities is not just an unhealthy inconvenience. Breathing that air is killing millions of people. A recent study in Nature estimated three million people died annually due to air quality. That number may be closer to 5.5 million premature deaths per year, according to a new study being presented today at the annual meeting of the American Association for the Advancement of Science. Looking at data from 188 countries, the University of British Columbia worked with the Institute for Health Metrics and Evaluation (IHME) at the University of Washington to compare health risk factors to air pollution levels from 1990 to 2013. Although air pollution has decreased over the last 20 years in many countries, global levels of dangerous emissions have increased. And due to surging population growth and rapid urbanisation, especially in places like China and South Asia, now a greater number of the world’s population—85 per cent—lives in a place where particulate matter levels exceed the World Health Organization’s healthy guidelines. What’s interesting about this study is that it focuses not just on the typical smog and particulate matter generated by the burning of fossil fuels, but also on indoor air quality. In developing nations, millions of people are at risk of premature death because they cook over fires in their homes, burning wood, coal, or dung inside. Breathing in that smoke can cause some of the worst lung and cardiovascular diseases. 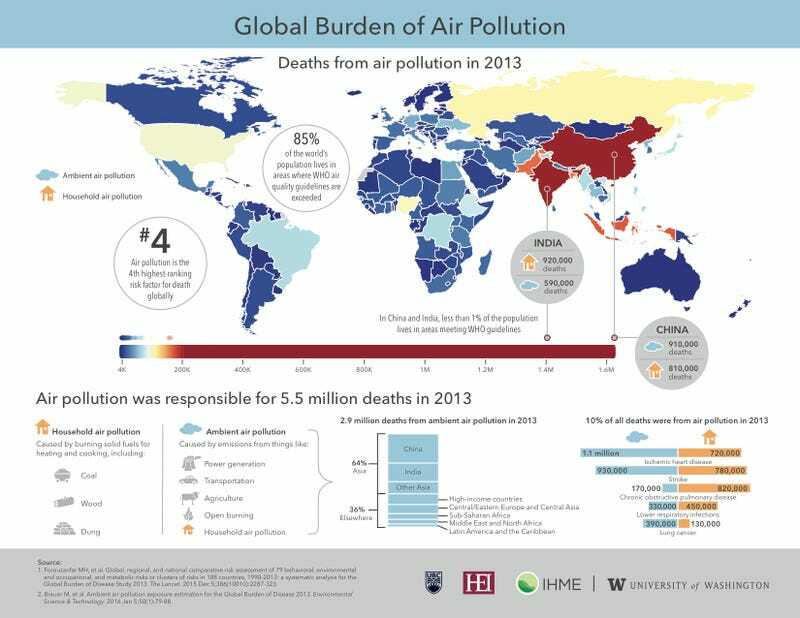 Although the study emphasises that air pollution is a global problem, China and India are home to more than half of the estimated deaths: About 1.6 million people died in China and 1.4 million died in India from air quality in 2013.